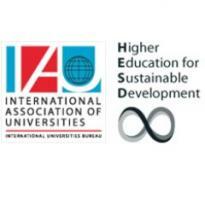 "IAU is advocating recognition and strengthening of the role higher education plays in the overall process of achieving sustainable development. IAU facilitates the dissemination of knowledge and best practices and encourages higher education institutions to take responsibility in this policy area." Help us in one of our key action areas and answer the HESD questionnaire. will help identify new information to be published on the IAU portal on HESD. The survey was developped thanks to Stefanie Mallow (Intern Higher Education Initiatives). You are warmly invited to take this survey and contribute with your answers to the work IAU develops for you in the field of sustainable development. The questionnaire will take about 20 minutes to complete, you can stop the survey at any time and resume it later. We thank all those who replied by July 3rd and September 10th (first and second deadlines for taking part). The initial results have been compiled and will be updated until the end of October. The initial results are available by clicking here. Next deadline is 10 October 2016. Thank you for your contribution.